All Of Chewbacca's Dialogue From Star Wars! Hundreds of 15 second fan-supplied & created scenes we cut back to back to create this bit of beauty. 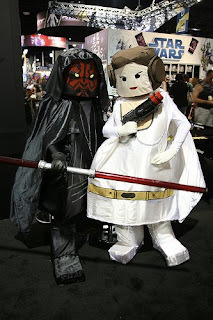 Lego and Star Wars are like peanut butter and jelly. Stop motion and YouTube are their bread. There is such a huge supply of great work out there, we are ready to see the best of list of the genre. For now though, we are willing to venture that this is worthy of inclusion on just such a list. Hope The Younger wanted this placed in The Bowl but the violence is a bit intense for the young 'uns, and we are not ashamed to confess our total love of these things anyway, so it's landing here today instead. Get ready for summer with an inflatable Death Star. We've been speculating here in our nose-filled bowls of what would be the great Lego mini-fig flick. We are working out the plot for Alien Invasion, but the bar has been raised. This will be in heavy rotation in our dish for quite some time I am sure. A cappella means without any instruments, just voices. This is just one voice, cloned four times, singing with itself. The song here is all about STAR WARS but uses the score from many of the composer John Williams other film score. Come over to The Dark Side! This video was the most sent around and linked to video in the country this week by the way. One day we will take the whole family and head to San Diego, but this year was not that year. Looks like it was pretty fun, and people did come up with some really good garb. Check out these posts.